I have had only one post in the past few weeks and by my own account, it was pretty rambling and disjointed. I think I will have more time to continue my writing pursuits, which of course takes only second place to my enjoyment of movies. As I write this, I am taking in The Shining. If you can believe it, it is my first viewing of this mind-bending thriller from master director, Stanley Kubrick. Holy manoli and then some, Jack Nicholson is truly an American icon of acting. 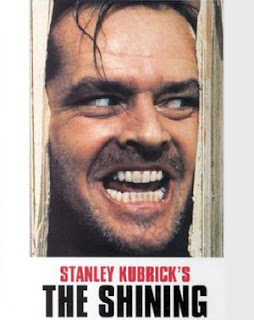 He is chewing up the scenery in glorious fashion and his performance combined with the creepy demeanor that Shelly Duvall seems always to project, combined even further with the eerie high pitched score and Kubrick's mastery of imagery, this is a film to truly be enjoyed. I only wish is was dark outside with a treacherous snow storm afoot. None the less, I am very much enjoying this! What have I seen that I haven't enjoyed as much? Well that would be The Tourist. I think the folks making this movie assumed that Johnny Depp + Angelina Jolie would automatically = success. It did not. This film was directed by Florian Henckel von Donnersmarck, who achieved some indie cred last year with the The Lives of Others, a German film that made waves in the art house rounds. Folks, I regret to say that a single successful film, doesn't guarantee you have chops. Who knows what the future may hold for this director, but if The Tourist is any indication, we have reason to worry. The Tourist is Johnny Depp, named Frank Tupelo. He is on holiday from his days as a math teacher in Wisconsin. He has the chance to live every man's dream...to meet Angelina Jolie on a train and to spark a little romance. Truth be told, Angie Jolie is a sharp looking lass and many are saying that she has never looked better. BUT, I am not particularly drawn to he and perhaps because of the hub-bub around her personal life, I am just easily annoyed by her antics. Her role here is subdued, which is true of much of this movie. Subdued. That is the primary flaw here...it's a snooze-fest. Until her big reveal, Angelina basically spends the film sulking around town. Now granted the town was nice to look at and there were some very stunning shots of Venice, our principal set for this film...but Angelina was just plain boring to watch! I have heard intermittent reports of folks thinking the chemistry between Depp and Jolie's Elise Clifton-Ward is off-the-chart. I say nay. What seems like it may be the fringe of chemistry is just each actor's ability to emote. Unfortunately, they each are on different wavelengths and I never felt any real relationship between the two of them. 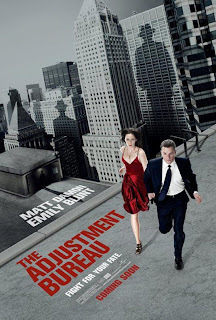 I thought that the film telegraphed each twist, which was unfortunate. If the film was full of action and thrills, poor relationships and foiled twists can be forgiven. Here, they are not. As a side note, I saw a trailer for The Tourist earlier. If this film delivered half the action it promised, all would be well. This particular TV spot had just about every bit of running, racing boats, and shooting that actually is in the movie. Paul Bettany was uninspired here and Rufus Sewell was poorly used. The gem of this film was Bond, James Bond. In the less is better department, Timothy Dalton was only featured in two parts of the film, but I enjoyed them both. Perhaps I was primed for Dalton on the big screen by his recent run on NBC's Chuck, but regardless, he was my favorite part of this flick. All in all, this is a barely watchable effort, which is getting a 2.5 of 5 horns from THE REEL RHINO. Sadly, there were some decent and funny lines, but we had all seen them already in the trailer. By the way, in the beware what you ask for department....it's now 10 hours later from when I started this and Kansas City is currently getting pounded by a bitter cold wind and snow storm. Fortunately, I have the last 45 minutes of The Shining to finish....oh boy, lemme get some popcorn! 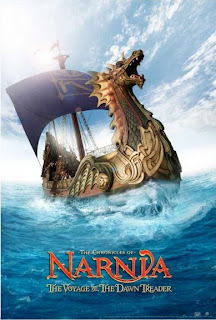 In the meantime from earlier today, I also made it out to check out THE CHRONICLES OF NARNIA: THE VOYAGE OF THE DAWN TREADER. 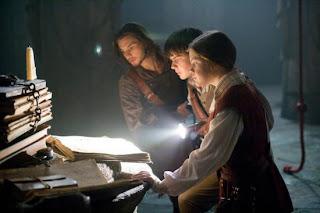 This is the third film offering in the Narnia series, one of seven books from legendary author C.S. Lewis. The books were written with Christian themes in mind, hints of Greek and Roman mythology, and in general created its own literary world that was mostly very unique. This film compared to the first two seems to have much more overt Christian themes, especially towards the end. I mean what movie doesn't draw parallels to stories from the bible or from different religions, so no big deal, but as the film going public, I think we like to see things a little less heavy handed. This one is the first distributed by 20th Century Fox as opposed to the first two which were the Mouse House. Disney had actually announced the end of the series with Caspian and Fox breathed new life into it. I can say that I wouldn't lose any sleep if it was over, but these moves have all been wholly watchable and this one in 3-D, was especially visually decent. The basics of the story are these: Lucy and Edward are back in Narnia, this time with their cousin Eustace(that's a boy cousin, FYI). 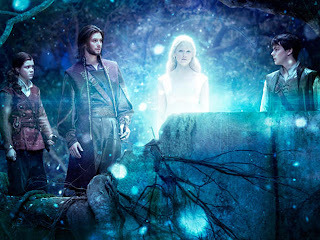 They are rescued from the water by Prince Caspian on the Dawn Treader after literally being dropped in the water after their transport from England. They quickly find that all in Narnia is not status-quo. They sail on a village that they expect to be flying Narnian flags, and there are none. The city has been overrun by slave traders and the crew of the Dawn Treader walk straight into a trap. While they quickly overcome this initial peril, they learn that the seven Lords of Narnia have gone missing and only the laying of the Seven Swords of the Lords (hey, that rhymes!) on the table of Aslan will make thinks right. Action and hijinx on the high seas ensue and the adventure is afoot. Again, I like these movies, but I don't love them. This one is right in line...a solid film that I would happily say is far superior to the Tourist, but these are two very different films. Voyage of the Dawn Treader gets 3.5 of 5 horns. As a side note, I was at first very annoyed by the character of Eustace, but I promise, if you feel the same, he grows on you quickly. I think this was the goal of the filmmaker, especially because it seems as though the Pevensie children have now all run their course through Narnia. Eustace has been tapped as the heir to the ongoing adventure. Hopefully the whole series gets made and they continue to improve on the delivery. Harry Potter it is not, but it is worth the trip to the theater (but maybe not the $14.00 it now costs to see a 3-D movie at the KC area AMC's). If you have a choice, go see 127 Hours from Danny Boyle, starring James Franco. Great flick and a great story. Well what happens is terrible, but it is, not to be too corny, a true story of human triumph. PS...we are approaching legitimate blizzard outside. PPS...great trailer for Transformers 3! I am a noted Michael Bay apologist and especially for my fanboy favorite Transformers! I have added the trailer at the bottom of the page...enjoy! PPPS...The Adjustment Bureau has reappeared in the trailer rotation at the movies. This was originally slated for a September release. Can we get on with this already? This flick looks amazing! Please, get this in the theater. I do hope it wasn't pulled to be re-cut for fear it was no bueno. Matt Damon is high on my list and I can watch General Zod in just about anything. It seems March 4th, 2011 is the new date. Great quote from It's Always Sunny in Philadelphia: "Without the sunglasses, Weekend at Bernie's would have been very dark."